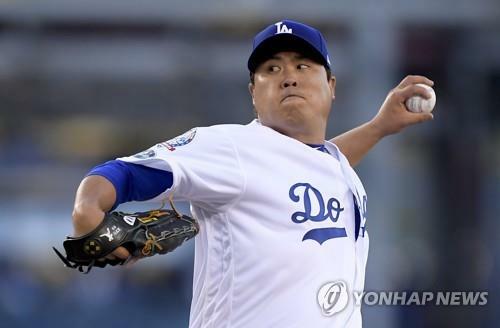 SEOUL, Oct. 12 (Yonhap) — Los Angeles Dodgers’ South Korean left-hander Ryu Hyun-jin will start Game 2 of the National League Championship Series (NLCS) against the Milwaukee Brewers. LA manager Dave Roberts announced Thursday (local time) that Ryu will take the mound for the second game of the best-of-seven series at Miller Park in Milwaukee. The game is at 4:09 p.m. Saturday Eastern Standard Time, and at 5:09 a.m. Sunday in Seoul. The move comes as a bit of a surprise, as Ryu had been expected to start Game 3 next Monday at Dodger Stadium in LA, with rookie right-hander Walker Buehler getting the Game 2 nod after Clayton Kershaw. Ryu pitched much better at home than on the road during the regular season, with a 5-2 record and a 1.15 ERA at Dodger Stadium and a 2-1 mark with a 3.58 ERA elsewhere. Ryu enters the series on a roll. He was the surprise Game 1 starter over Kershaw in the NL Division Series versus the Atlanta Braves on Oct. 4, and silenced doubters with seven shutout innings in a 6-0 victory. Over his past four starts, counting the postseason, Ryu has given up just one run in 26 innings, with 24 strikeouts against only two walks. Roberts explained that he wanted to ride Ryu’s hot hands while he could, and also use Buehler, who took the loss in Game 3 against the Braves last Sunday, on extra rest at home. The Brewers will counter with left-hander Wade Miley in Game 2. Ryu has only faced the Brewers once in his career, getting a win after allowing two runs on six hits in 7 1/3 innings at Miller Park on May 22, 2013. He’ll be facing a vastly different lineup this time around. Led by the NL MVP candidate Christian Yelich’s 36 home runs, the Brewers ranked second in the league behind the Dodgers with 218 dingers and topped the senior circuit with 124 steals. The Dodgers have made the postseason every year since Ryu’s rookie season in 2013. But this is Ryu’s first postseason appearance since 2014, after making just one regular season start between 2015 and 2016 after shoulder and elbow surgeries, and getting left off the Dodgers’ postseason rosters in 2017. In four career postseason starts, Ryu has gone 2-0 with a 1.96 ERA, along with 17 strikeouts and three walks in 23 innings.